One would think since I have opposed this illegal, immoral, and unjust war since before it started from pulpit, computer, street, and campus (video of speech starts at 3:49), that I would be tickled by the news that "Operation Iraqi Freedom" [sic] -- wait make that [bold and cap SIC] -- is over as our leader has spoken. I am not tickled, because it is simply more smoke and mirrors. Don't think that the U.S. has left or ever will leave Iraq. We simply change the name of the "mission" and turn over aspects of the "mission" (guarding oil production and transport) to private security. Iraq has about 115 billion barrels of oil, which is about 10 percent of the world's reserves. As Earthlings descend into chaos and war for the remaining reserves, Iraq's kitty will come in handy for our declining Empire. Now that the oil is secure in Iraq, on we go to Afghanistan. Obama just sent another 30,000 troops there. Now we have 100,000 troops in Afghanistan. Why? Check this interesting August 2009 interview on Russian Television with former Soviet General General Mahmut Gareev. "Essentially they are not going to interfere and stop the production of drugs. They engage in military action only when they are attacked. They don't have any planned military action to eliminate the Mujahideen. Rather they want to make the situation more unstable and help the Taliban to be more active. They even started negotiations with them trying to direct them to the Central Asian republics to destabilize the whole region and to set up their bases there." Interestingly, the U.S. admits that it is protecting the opium harvests as Fox tool, Geraldo Rivera reports. Of course, Rivera is clueless as to the reason as this report shows. 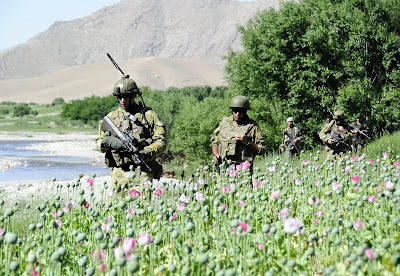 He repeats the latest military lie that we are protecting opium fields for security reasons. Yeah, right. Oh, by the way, Afghanistan has a nice supply of lithium for our cell phones, laptops, and blackberries. Once again I am amazed at the arrogance of the U.S. to admit publicly that we are protecting the poppy fields and then interview with TV reporters and lie about the reasons knowing that Americans are too stupid to care. Here are some interesting links that will take you to other interesting places. Mike Ruppert has been documenting connections between the CIA and drugs for a long time. Check it for yourself. Speaking of Mike Ruppert, "Oh, Lucy! You Gotta Lotta 'Splainin' To Do" is a good start to the week leading up to the ninth anniversary of the 9/11 false flag operation that has changed the world. This coming week I am going to be making some posts about 9/11. The reason for the posts is to highlight the reason for our Empire's insanity. Why did our leaders do this? Why were they so desperate? The reason for those desperate acts and the reason for these insane wars is still there. Global oil production has peaked and industrial civilization has begun its collapse. There is no stopping it. However, we can try at least to be decent. I think that is why many of us voted for Obama. Sincere people who wanted peace, justice, and truth voted for Obama thinking he would be honest. Apparently, the forces are too powerful. He can't seem to bring himself to tell the truth about the state of the world and its collapse. Then again, very few can. I feel the same way. This is not the end of operations. It is the end of the flag-waving, parades and yellow ribbons. It now goes under wraps, not to be discussed in polite company. The only thing that makes this a "victory" is that the PR machine has made it more palatable than our exit from Viet Nam. Obama is a disappointment not because he has failed to be open and honest and fulfill his campaign pledges. I hadn't expected him to do half of what he said he would do. He is a disappointment because he hasn't really tried, as far as I can tell. Then again, if he did tell the "real truth" he would be as "electable" as Dennis Kucinich, sadly. No, it is NOT over. How do I know? My friend TJ is being deployed for 14 months, leaving his wife and 4 kids. That is horrible. I know he signed up for this, but if this were REALLY over we wouldn't need anyone in Iraq, much less the reservists. I'm furious at Obama. *sigh*. I voted for him but I knew from the start of his campaign that he wouldn't be the great biracial hope all my liberal friends wanted me to believe he was. The interview with the Soviet general was insightful. We won't listen to him anymore than we did the French in Vietnam. Yes, I was hopeful that Obama could have done more. The Democrats in Congress bear a good deal of responsibility. They deserve to lose. Unfortunately, there are lunatics in line to replace them. Iraq, Afghanistan, immigration, recession, Israel/Palestine, Iran, Republicans, and a growing whining and moaning public. For me, Obama is doing the best he can with the hand he has been dealt. He has my support. Looking forward to your postings on 9/11. ...there are lunatics in line to replace them. That's the truth. I have to remind myself that I keep the bar very low for politicians, including the president. I really don't expect much from them. That bar is that when panic hits, they aren't going to press the button. I think (hope) that Obama would be less likely to start a nuclear exchange than, oh, say, Sarah Palin. Agreed on all counts. The Dems in office are more worried about staying there than anything. Of course, those Mad Haters stepping up to replace them will be even worse. Let's see: 50,000 troops still in Iraq? Doesn't sound like we left to me! Oh and as for Vietnam, when the president makes military decisions from the White House depending on the poles the likelihood of winning is already in the cesspool. And opium support the CIA in Southeast Asia too. Not that we actually supported the deal between the North and the South which was made in 1954. Johnson did a lot of good during his term. If he had gotten out of Vietnam he would have been remembered for the Voting Rights Act, etc., not the war. Excellent post. I love your righteous anger.